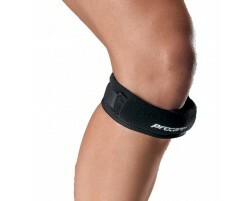 Knee bands, also known as knee straps, help to relieve pressure off the patellar tendon in the knee. When the patellar tendon is strained past its normal range of motion, it can cause inflammation and patellar tendonitis - leading to knee pain and discomfort. This is exactly what knee bands help prevent. They apply gentle pressure to the front of the knee, which alleviates stress from the patellar tendon. This is especially important for people who participate in activities that apply force on the knees, such as sports. Sports that involve lots of running or jumping put pressure on the knees because of the constant impact between the leg and the ground. That's why many athletes wear jumpers knee bands to help prevent knee pain and injury resulting from the stress on their knees. If you are looking for a patellofemoral pain brace, click here.